Ian Duncan St. Mark’s in the Bowery as it looks today, and below, a rendering of one of the towers that might have stood on the site, courtesy of Modern Mechanix. Frank Lloyd Wright is probably not a name to make the hearts of preservationists quake. But if the architect had had his way, tonight’s debate on a new East Village historic district would have been held in a very different context. In the late 1920’s, Wright proposed tearing down the row houses on East 10th and Stuyvesant Streets and building over the cemetery at St. Mark’s in the Bowery to make way for four glass skyscrapers. Plans held by the Museum of Modern Art show the church crowded in by the towers: at 19 stories they would have rivaled the Cooper Square Hotel for size. 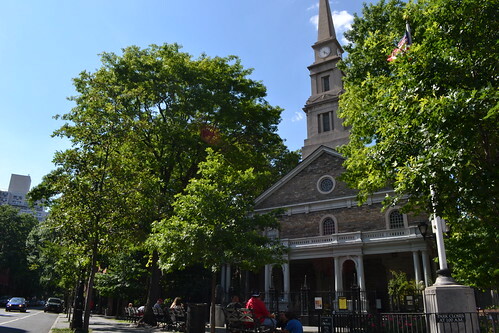 And just as two East Village clerics have come out as opponents of the preservation area, it was The Reverend William Norman Guthrie, the rector of St. Mark’s, egging Wright on. The church’s once-affluent congregation had been whittled away as the Lower East Side became a home to immigrants. Guthrie approached Wright in 1927, commissioning him to design an apartment tower on church land, hoping the rent would restore its ailing finances. Under pressure from modernist ideas developed by European architects such as Le Corbusier, Wright proposed four towers set in a park, demonstrating his understanding of the latest architectural trends. “One of the unusual features of this building is that no structural steel will be used anywhere in the glass house,” explained a writer for Modern Mechanix in June 1930. Instead, each tower would have been based around a reinforced concrete core, which would have held the elevator and utility lines. The floors would branch off this core, floating in air, and leaving the exterior as uninterrupted glass and copper. 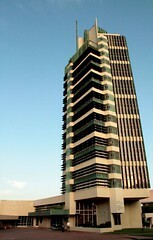 Eric Wittman The Price Tower. Wright hoped to bring something of the suburbs into the city. Residents would have arrived home through a leafy park into duplex apartments flooded with light by double-height windows. The copper accents on the exterior would gradually have weathered and turned green, suggesting the building’s lifecycle and its connection to nature. Ultimately, though, the plan proved too bold for Guthrie and the members of the church. With support for Wright’s project wavering and potential lenders unwilling to take a risk on a new building design, the towers were never built. In 1969, the area around East 10th Street between Second and Third Avenues was designated as the St. Mark’s historic district, guaranteeing the future of the existing brick houses there. 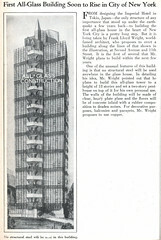 But Wright did not let the idea for a glass skyscraper rest and, in 1956, his vision was at least partially realized with the construction of the Price Tower in Bartlesville, Okla.
Around the same time, the concept of towers in a park gained a following with planners at the New York City Housing Authority and an echo of Wright’s vision can be seen in the Jacob Riis Houses east of Avenue D.